Our emergency towing and roadside assistance is never far away. We have a large fleet at the ready, and our 24-hour dispatcher sends out well-prepared professionals for towing in Pleasant Hill and the surrounding area. With us, there is always fast, efficient towing near you. Whether you have a fleet vehicle you need to get back to work or your commuter car has broken down, we offer affordable local towing by experienced, certified professionals you can rely on. Staying on the side of the road can be dangerous. For commercial vehicles, it means money wasted the longer you sit. We get to you fast, we come fully prepared, and we offer comprehensive services to cover each unique towing situation. Get a tow truck on the way – FAST! Our fleet of tow trucks includes flatbeds, cranes, and general tow trucks. We can get any car out of just about any situation. Each towing professional on our team is well vetted. We provide ample support and training, and each individual is supervised until he or she is ready to handle any situation on their own. As a locally-owned business, we understand the importance of building trust in the community. That is why, for over 30 years, we have been dedicated to quick, friendly, professional service people can rely on. In addition to towing, we offer a full range of roadside assistance services, like repairing a flat, fuel delivery, assistance getting unstuck from the mud or out of a ditch. Locked out of your vehicle? Let us help! 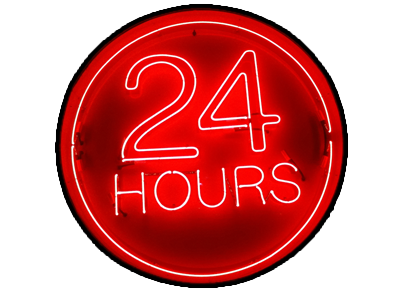 Call 24/7 any day of the year for a trusted towing. Help is on the way!